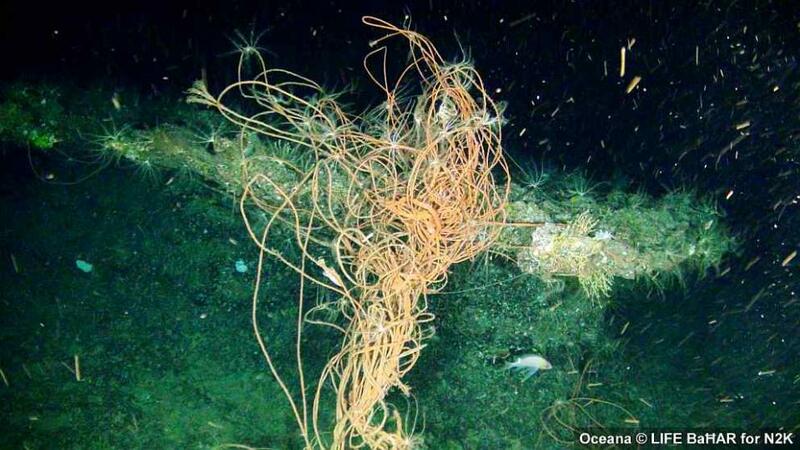 As part of the LIFE BaĦAR for N2K project, 420,000 m2 of the deep seabed within the 25 nautical mile Fisheries Management Zone surrounding the Maltese Islands were explored during two expeditions in 2015 and 2016. Surveys with an underwater robot, equipped with a video camera, recorded the bottom down to depths of 1,040 m.
Scientists from the Department of Biology of the University of Malta, who are responsible for analysing the results, were surprised at the amount of litter they noted on the sea floor. Discarded fishing gear as well as plastic, glass bottles and metallic objects including rods, cables, discarded car parts and oil drums, have accumulated in the deep sea. 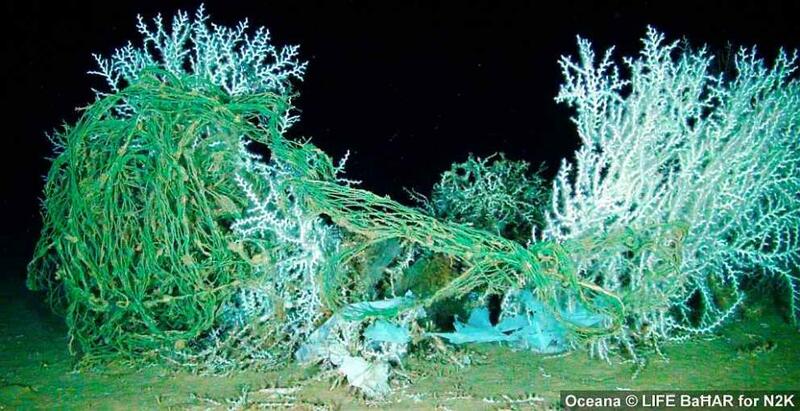 In particular, discarded fishing gear such as trawl nets, nylon longlines and limestone slabs with synthetic ropes from the dolphinfish (‘lampuki‘ in Maltese) fishery were common at offshore sites. 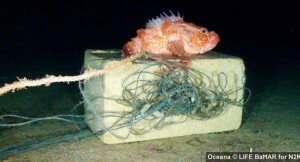 Dolphinfish aggregation devices (‘kannizzati‘) are anchored to the sea floor with limestone slabs, and the mooring ropes are cut off and discarded at the end of each fishing season. The limestone slabs may cause direct damage to reef species when they are deposited on the bottom, while the long discarded ropes can become entangled with organisms such as vulnerable deep-water stony and gorgonian corals. Nylon lines from bottom longline fisheries targeting for example hake, greater forkbeard, and dogfish were frequently found entangled on deep-sea reefs. 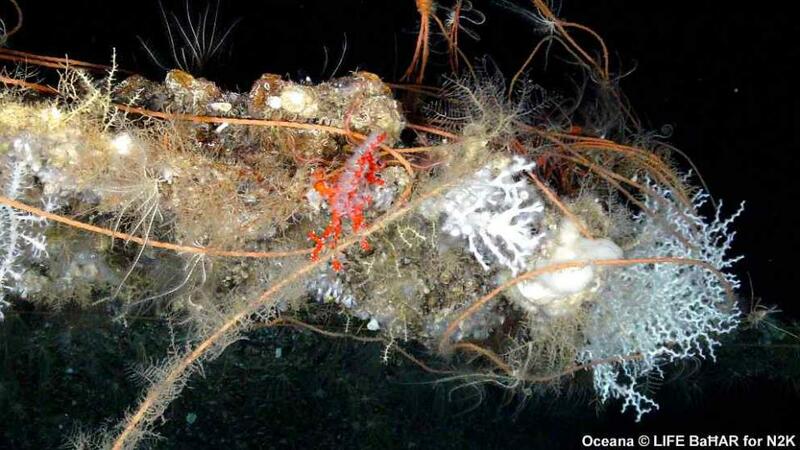 Although offshore litter is a known problem, the extent revealed by these comprehensive video surveys of previously unexplored areas came as a surprise; litter was observed during every one of the more than 200 dives with the underwater robot, operated by Oceana. The LIFE BaĦAR for N2K project ultimately aims to ensure that vulnerable marine habitats, including deep water coral reefs, acquire protection through the designation of marine protected sites under Natura 2000, the European Union network that collectively safeguards the EU’s most valuable natural areas. The information gathered during the surveys will enable the formulation of more effective conservation measures to address the identified pressures, including marine litter and ghost fishing. An After-LIFE Conservation Plan detailing management and conservation activities after the project end date will be formulated through the LIFE BaĦAR for N2K project to guide all the stakeholders involved.